This is honestly one of the easiest desserts you could ever make, I don’t know why I don’t make it more often. Such simple ingredients too, egg whites, sugar, cream and raspberries. It is so light, perfect for having at the end of a meal and it looks the part too. You could use strawberries or a mixture of both if you like. I used raspberries this time as I was making it for my Mum who is allergic to strawberries! Don’t for a moment hesitate about the roll up part of it – you have just got to be brave and go for it by bossing the meringue using the baking parchment to help you wrap it into the roll shape. You might start to freak out when you see the cracks appearing however this is exactly how it is meant to look! You can make the meringue part in advance however don’t fill with cream and raspberries until 1 hour or two before serving. Line a 30 x 20cm (12 x 8 inch) swiss roll tin with baking parchment. Gradually add the remaining caster sugar, continuing to whisk for 10-15 minutes, until it forms stiff peaks. Roll up the meringue from the long side, using the baking parchment to help lift and roll it. 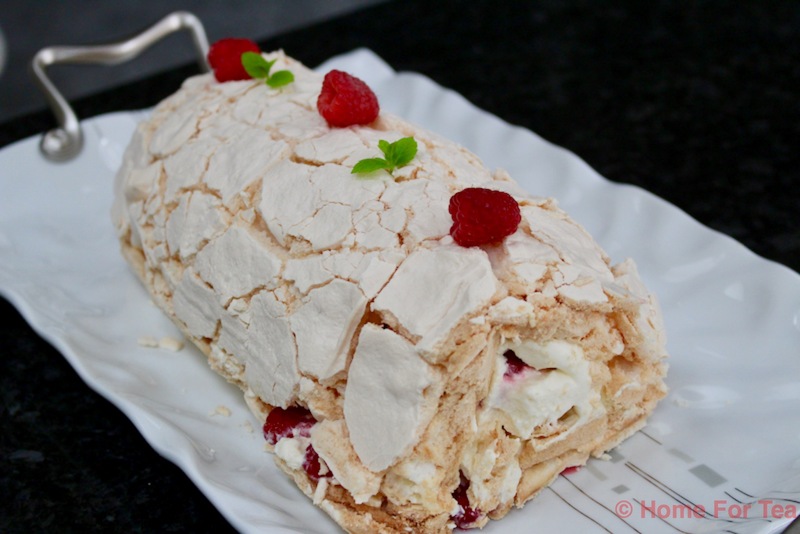 Wrap the roulade in the baking parchment and chill in the fridge for for about 30 minutes. Lightly dust with sifted icing sugar and / or fresh raspberries, mint leaves before serving.